Apple crisp, and it’s many variations, are such a staple that trying to codify it into some type of written recipe seemed almost sacrilegious. But there are a few essential elements, and some crisps have been better than others, so it seems like it’s probably worth sorting through the half dozen recipes that we usually flip-flop between (and then disregard almost entirely when I find I don’t have the right ingredients or specified amounts…) and write down what seems to be the sum total of all that is good about oats for dessert. So here it is…feel free to disregard and omit and change and double quantities at will…crisps are hearty beasts, and seem to take well to sloppy measure-ers and other such renegades! ½ cup Flax seeds, chopped almonds, hazelnuts, sunflower seeds, pumpkin seeds, or...? Combine apples, flour, and sugar in a greased casserole dish. Sprinkle with water. In a small bowl, combine rolled oats, brown sugar, and spices. Cut in butter with a pastry knife until mixture is crumbly, then add the nuts/seeds. Sprinkle oat mixture over top of the filling. Bake for 40 minutes, or until fruit is soft and the topping is crispy. Serve with vanilla ice cream or whipped cream for extra special crisp-y-ness! 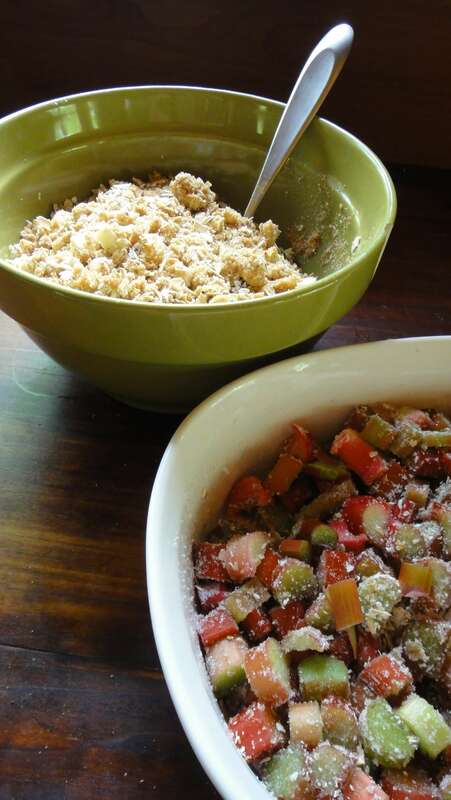 Use 2 cups of sliced strawberries and 1 cup of diced rhubarb (about 3 stalks). Omit the water as strawberries are a bit more liquid-y, and increase the flour/cornstarch to 2 tbsp. Use 3 cups fresh or frozen berries…saskatoons and raspberries are a great combo. Cherries are yummy on their own, but a bit lonely without almonds and a tsp of almond extract in the filling. Use 2 cups of apples and 1 cup of cranberries…the commercial variety are fine and all, but if you can find yourself some wild highbush cranberries you’re in for an extra special surprise (although you might want to start off with just 1/2 cup in your fruit mix). The highbush variety is not technically a cranberry, but as close as it comes in Manitoba, and if the tartness doesn’t bowl you over, the flavour is really amazing! You can add a touch of extra sugar along with the fruit mix to compensate for the tartness if you’re not feeling entirely adventurous. We like them best with some mellow pumpkin seeds in the topping.